The Condo Wall and The Clamshell will remain OPEN for the entire project. The projected completion date and subsequent reopening of the climbing areas is planned for mid-October 2018. Please respect the closure and stay clear of the area. UDOT was mandated by the US Army to reduce their dependency on artillery and to eliminate the practice of shooting overhead of inhabited buildings. Devices such as Gazex and Wyssen exploders can reduce the avalanche threat without the risk of shrapnel. The eight exploders in Hellgate will serve that purpose as well as increase the efficiency of the control efforts. They will be fully operational for the winter of 2018-2019. 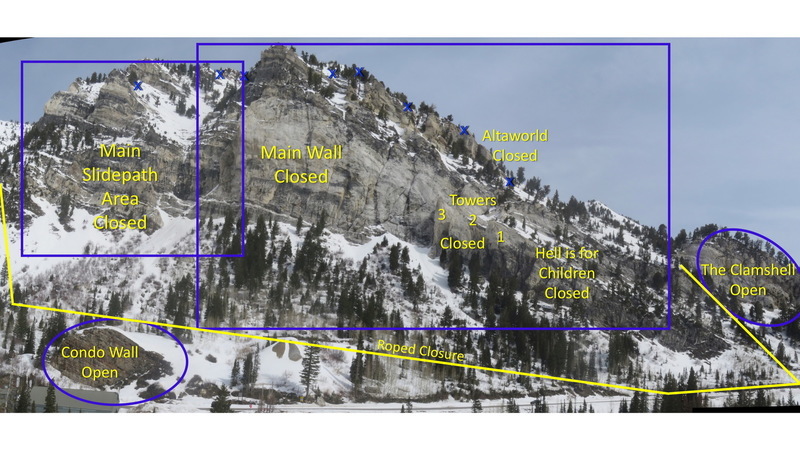 This is a public safety decision and it’s imperative that climbers stay clear of this area for their safety and to regain access to the zone in 2019. Mostly bolted climbing on steep limestone towers at alpine elevations. Bring a small rack as many of the routes do require gear placements. And bring a helmet! The Hellgate Cliffs are infamous for loose rock, especially in the early to mid summer. Watch for loose holds, and do not belay directly below your leader. Most of the climbing is 5.9 and harder, though there are a few 5.7s here. 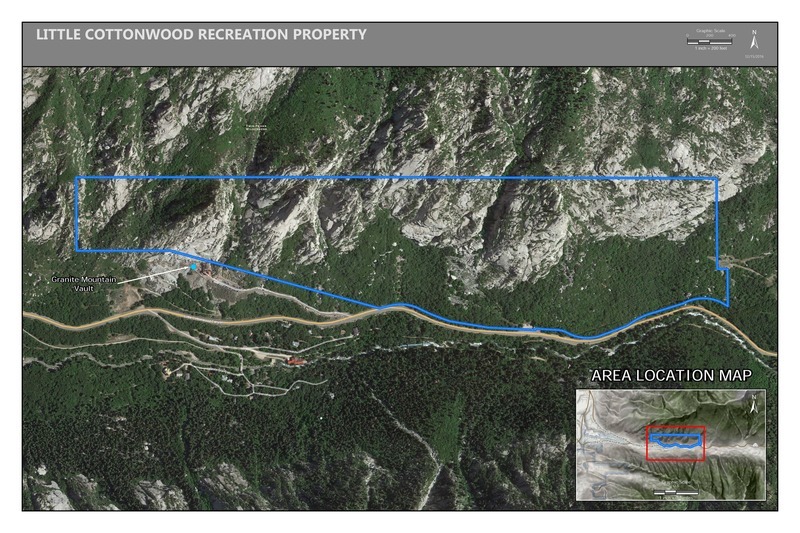 Also, the Clamshell has seen recent developments as well, and is just up canyon. Most routes require a two-rope rappel. Drive to Snowbird and keep going a little ways. The Hellgate Cliffs are the obvious white limestone towers on the north side of the canyon. Park at a pullout just up canyon and across the road from the Hellgate Condos. Walk up the dirt road to a gully just before the chain gate, and head up. I vote for better organisation and separating the routes on Main Hellgate and the three Hellgate towers from East Hellgate (formerly known as the Clamshell). East Hellgate has been grid bolted to the point that using this site with all the routes in all the various Hellgate areas in ONE area is extremely confusing. By making a separate area for East Hellgate which would include the Melting Mud Wall and everything East of and including A CLOUD IN THE SKY will be alot more helpful for people trying to navigate themselves around the place or hoping to glean beta from this web site. It would be as if all the routes between Green A Gully and Beckey's Wall was just under Gate Buttress with no distinction between the 6 or so separate areas that actually exist. "Mountain Project, I believe, is first and foremost an online guidebook. One line route descriptions without topos thrown into the mix where they subsequently are listed alphabetically for a single area with 50-60 1/2 pitch routes.... well, it makes it nearly useless or practically impossible for getting the climber to the route. If beta is so brief as to be vague at best, what is the point of reporting it at all? On the other hand, if the reporter really would rather not have other climbers find the route or the area, again, why report it at all? (please refrain from just taking up space!)" Someone(James?) create a brand new Hellgate overview area, and then add new empty areas underneath it for the various sub areas. At that point, i'll move the route descriptions to the proper places, and y'all can yell at me when i get one wrong. And Greg, would you mind cleaning up the route descriptions, or would you mind if volunteers take over the route and add better descriptions? Yes, I will try to get on it in the next couple of days. Andrew....that does sound like the best way to do it if it is OK with Gregorio. Might want to mention that you are - or not - affiliated with Greg since your triple endorsement makes you sound very eager. Boissal, I wish I saw your note a year ago. I have no affiliation with or personal gain from Greg's map. I simply copied and pasted the note, since it seems most climbers don't know where to get a map.